I like to daydream about owning my own restaurant. 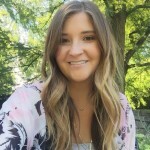 I have two ideas – one is a taco food truck… and the other doesn’t have a specific concept (because I’m too all over the place when it comes to food), but I like to keep its hypothetical menu in my head. My whole categories system sounds cheesy when I say it out loud (er, type it out? ), but I like it. And that’s what matters. Right? Anyway, let’s take a moment and talk about how it’s still summer. Although pumpkins, apples, and mums are popping up everywhere, it is still summer. I’m still eating peaches. And tomatoes. I might cry when I no longer have tomatoes coming from my garden. Luckily I’ve been filling my pantry with sauce, soup, and stewed tomatoes. I’ve even made a few batches of my roasted cherry tomato sauce to pop in the freezer. Hopefully I have enough forms of summer tomatoes to get me through the winter! 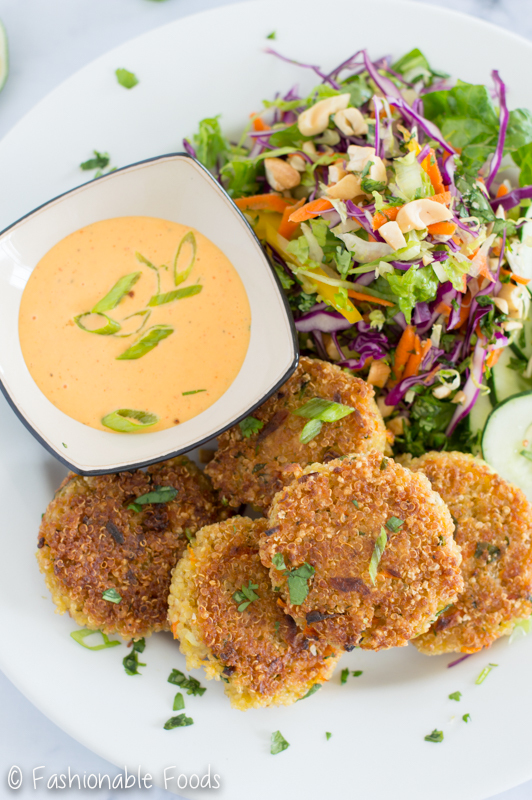 Alright, let’s get back to Thai-style quinoa cakes! I’m always looking for new ways to eat quinoa. I love having it as a side dish, in a salad, or as a swap for rice. But sometimes you just want something a little different. And these crispy cakes are perfect for that! 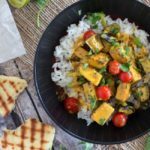 Not only is this vegetarian meal super tasty, but it’s really filling too. 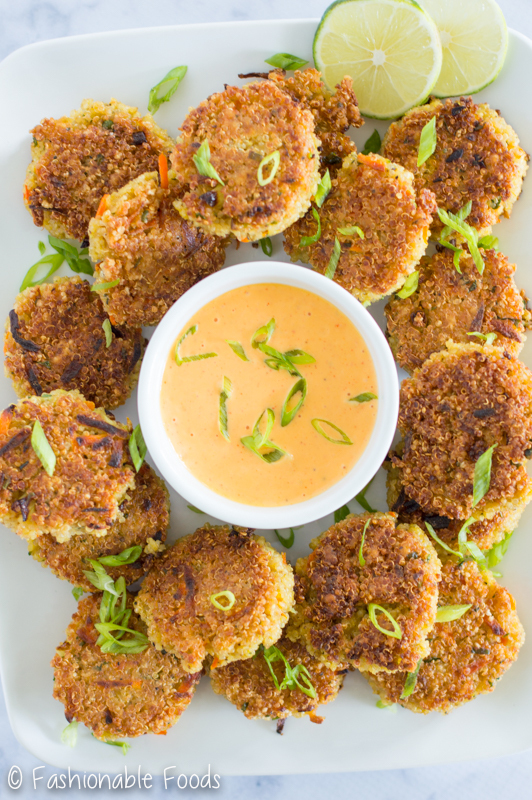 There’s so much texture going on between the crunchy vegetables and the crispy quinoa cakes… and that creamy sriracha sauce. ??? One taste of the sriracha sauce and you’re going to want to put it on everything! 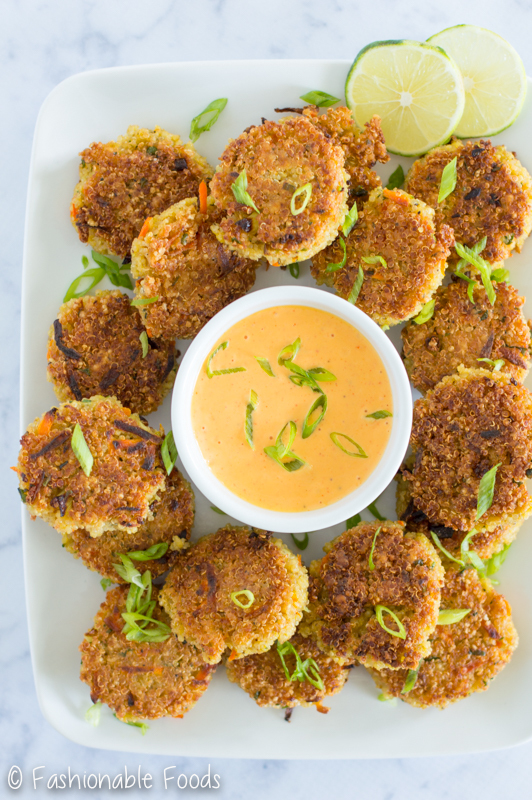 You can serve these quinoa cakes with the salad for dinner, or you can serve the cakes alongside the sauce as an appetizer. One bite and you’ll be hooked! The quinoa cakes also freeze well, so you can make a big batch and have them on hand whenever the craving strikes. 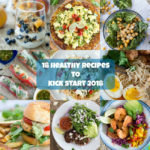 Healthy, filling, and delicious? What more could you want in a meal?! Have a fabulous week, my friends! ✌? Looking for a new way to enjoy quinoa? 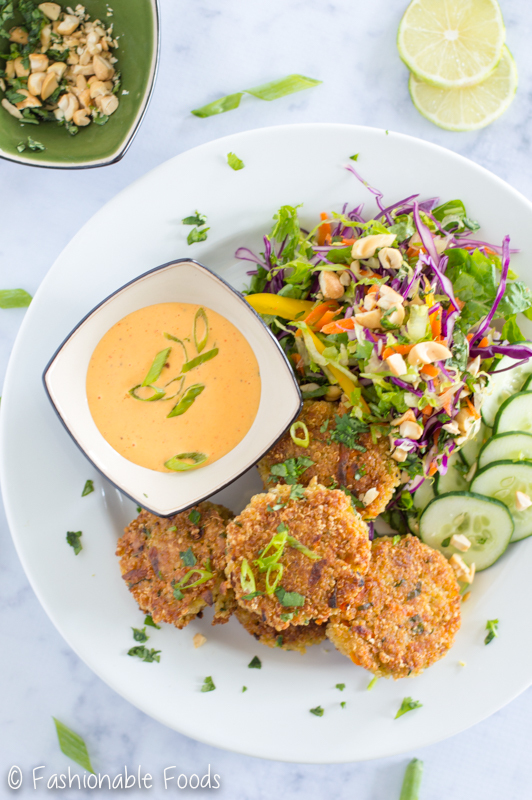 You’re going to love these crispy thai-style quinoa cakes! 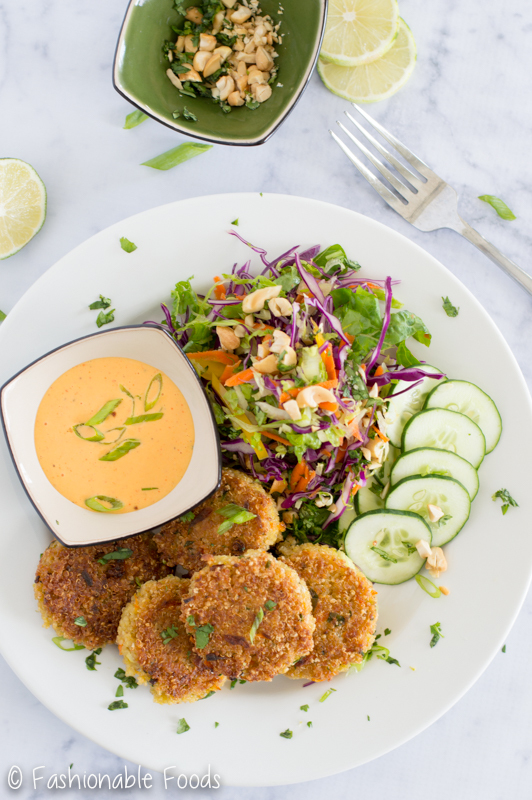 They are absolutely delicious over a vegetable salad and topped with creamy sriracha sauce – perfect meatless meal! 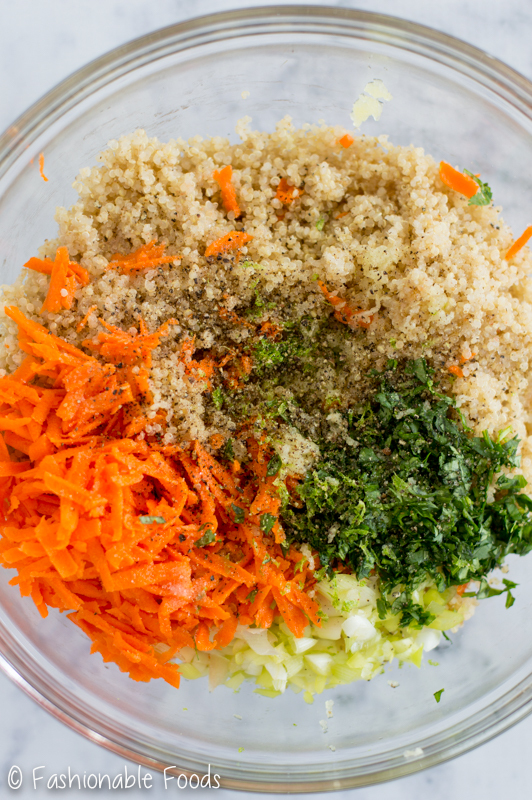 Combine the quinoa, carrot, cilantro, scallions, garlic, eggs, a nice pinch of salt and pepper, and breadcrumbs in a large bowl. Stir until well combined. The mixture should hold together when you try to form a cake (if it doesn’t, add a little water until they hold together). If the mixture is a little sticky and you’re struggling, wet your hands to help you in forming the cakes. Heat a large skillet over medium-high heat and add enough oil to coat the bottom of the pan. Add the cakes into the pan and cook them for a few minutes on each side, until golden brown and crisp. Drain on paper towels and repeat until all the cakes have been cooked. Combine the mayo, coconut milk, sriracha, lime juice, scallions, and garlic in a food processor or blender. Blend until smooth and then season with salt and pepper to taste. Toss the romaine, cabbage, carrot, and bell pepper in a bowl. Divide the mixture evenly among serving dishes and arrange cucumber slices alongside the salad. Top with desired amount of quinoa cakes and sprinkle each portion with cashews, cilantro, and scallions. Drizzle with the sauce and enjoy! *If you're not gluten-free, you can use regular breadcrumbs. This recipe looks delicious! I see it serves 4, but how many quinoa cakes are equivalent to one serving? I’m trying to decide if this recipe as is will be enough for lunch for the school week (mon-thurs) or if I should double it. Can’t wait to try either way! 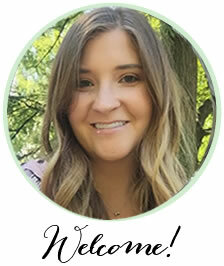 Hi Ellen! The recipe makes about 18-20 cakes depending on the size you make them. I’d say 4 -5 cakes was a satisfying serving for dinner, so I’d definitely say this would be enough for lunch for the school week! I’m always generous with my serving amounts because we have hearty appetites in my house 😉 I hope you enjoy! I think we are going to buy quinoa and try these! Do you suggest sriracha, or have you tried them with anything else? I haven’t tried them with anything else.. I really love the sriracha! Let me know how you like them! 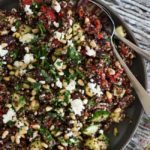 Do you have any nutritional info for this recipe? looks yummy!